"Honest Christian Answers to Real Struggles"
In CATCHING FAITH, Christian mother Alexa Taylor must reevaluate her seemingly perfect life when it is upended by a series of troubling events: the death of her father, her son caught drinking, her daughter cheating on a test, her marriage shaken by a lie, etc. CATCHING FAITH is genuinely engaging and does a good job courageously facing down tough choices confronting today’s Christian families. Strong Christian values and important faith discussions make this movie appropriate for the whole family. Modern Christian families face many complicated issues. Following God’s will and doing the right thing can be confusing paths and aren’t always clear. Director John K.D. Graham’s movie CATCHING FAITH dives into these discussions, courageously choosing to examine the tough choices faced by Christian families. The movie follows Alexa Taylor (Lorena Segura York) and her seemingly perfect family. Her husband, John (Dariush Moslemi), is a successful CFO. Her son, Beau (Garrett Westton), is a high-school football star. Last but not least, her daughter, Ravyn (Bethany Peterson), is almost valedictorian and has an early admittance to MIT. However, when Alexa’s father (and her children’s beloved grandfather) dies suddenly, their perfect life starts to show its cracks. Tough situations present themselves one after another. Beau is caught drinking at a party. Ravyn steals a copy of her AP Latin final, intending to cheat. Alexa’s mother moves into the family home and tries to take over the house. Alexa herself injects a lie into her marriage with John, which causes her much guilt. All these problems force the Taylor family to make hard choices about how seriously they take their faith and whether they really want to do the right thing, even when it’s hard. Director John Graham, who co-wrote the script, does a capable job in crafting this movie. CATCHING FAITH is genuinely interesting and seems honest. Christian movies, especially, can be hard to craft because so much of the tension and plot revolve around internal choices of faith. By choosing to take these internal decisions and insert them into a story with external conflicts, Graham provides viewers with character journeys that audiences can easily follow. While the script is occasionally choppy, the performances (especially by Moslemi and Westton) are strong and help smooth out some of the choppier parts. CATCHING FAITH is based on a Bible study by Andrea Polnaszek called “The Elijah Project,” which uses the story of Elijah to challenge participants to “Realize, Reflect, Reconcile, Recognize, and Re-Engage.” Some lengthy scenes in the movie are simply a women’s small group doing “The Elijah Project” together. While those scenes could feel like an advertisement for the Bible Study, the screenwriters cleverly fold important recognition and reversal scenes into the dialogue. CATCHING FAITH has good direction, good camerawork and good acting, but some dialogue was overpowered by the music. Alexandra Boylan was great as the villain. The climax was a little too early. There is a strong Christian worldview in CATCHING FAITH. The core of the plot is a question of faith: will the Taylor family trust God and do the right thing? Biblical values abound, and the characters learn important lessons about honesty, integrity, faith, and forgiveness. Underage drinking is a prominent part of the plot, as is cheating on a test. However, these problematic decisions are the sin from which the characters must escape and choose God’s will instead. Their bad behaviors are rebuked and give the characters touch choices with which to wrestle. There is also some sports-violence since the movie centers on high school football. At the end of CATCHING FAITH, the characters are rewarded for following God’s plan by getting all the things they wanted in the course of the movie. This might warrant further discussion if people use CATCHING FAITH for a family devotion or youth group. 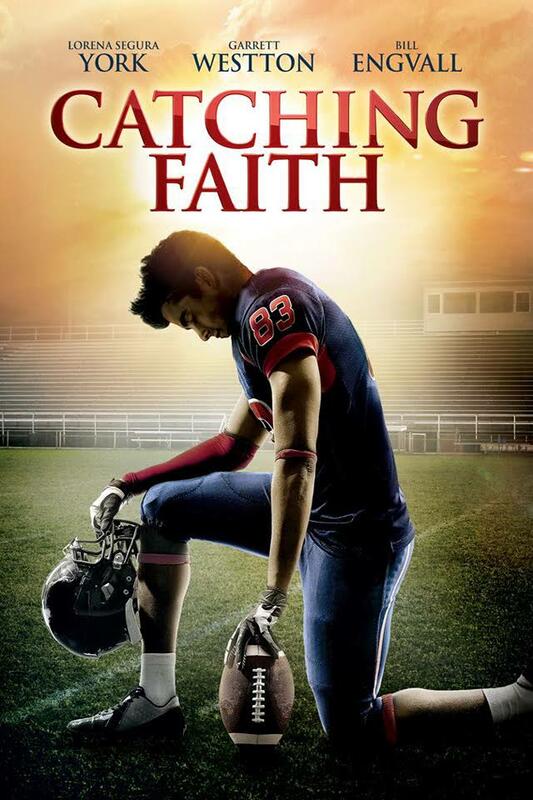 Despite this small issue, the strong Christian message and real-life questions in CATCHING FAITH make this movie appropriate for the whole family. Cheating on tests but rebuked, lying to a spouse but rebuked, and several dysfunctional relationships between parents and children, but the personal conflicts are positively resolved and the relationships restored. CATCHING FAITH tells the story of the Taylor family, a wealthy, churchgoing Christian family whose life seems perfect. John, the father, is the CFO of a successful company. Beau, the son, is the star of the high-school football team. Ravyn, the daughter, is almost valedictorian. Finally, Alexa, the mother, is a stay-at-home mom who seems to have everything going for her. However, when Alexa’s father suddenly passes away, this sets off a series of challenges forcing Alexa and her family to evaluate how seriously they take their faith and what it means to do the right thing.